NOW AVAILABLE IN HIGH VISIBILITY ORANGE. The Cavern/Safety Reel came about as North Florida cave training agencies began establishing standards in cave training. The established standard for cavern divers was to limit penetration no farther than 130 linear feet from daylight. 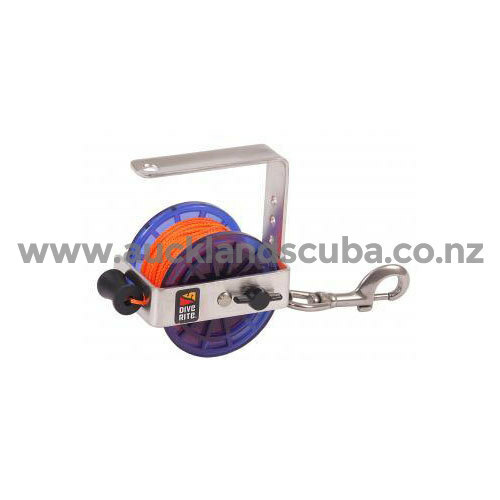 Experienced cave divers use the Cavern/Safety reel as a jump reel or as a back up for security. Wreck divers will use this reel for shooting lift bags. The Cavern/Safety Reel is available with 140-feet of #24 line (RE4100) or 90-feet of heavier #36 line (RE4110), both with a medium stainless bolt snap. These reels position the handle on top, which helps divers who use a handheld light to hold both the light and the reel in one hand, freeing the other hand to work the reel. 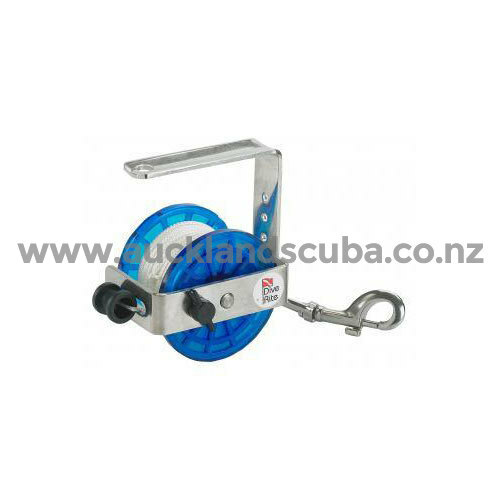 The frame of the reel comes with a series of pre-drilled holes so divers can change positions from a top-mount handle, to a side-mount handle or a left-hand operated reel. The spool is held in place with a stainless steel "C" clip so replacing the spool or cleaning up a jammed reel is simple.